We all know the importance of web hosting nowadays in businesses. And do not get surprised, even small and medium scale businesses have realized the worth, importance and significance of web hosting solutions offered by various web hosting companies. It isn’t enough for them to have a functioning website in order to stay competitive. From the past few years, all trade transactions have been shifted online and small businesses have realised that it is crucial for the success of their company to choose the right web-hosting provider. There has been huge competition and demand for web hosting services, therefore web-hosting companies provide various packages and services at affordable rates. Shared hosting servers are mostly used for small businesses and start-ups. Shared hosting is a very common type of web hosting where the service provider hosts lot more websites on one physical web server. Multiple sites are hosted on one server, and therefore it is less expensive and affordable for start-ups. 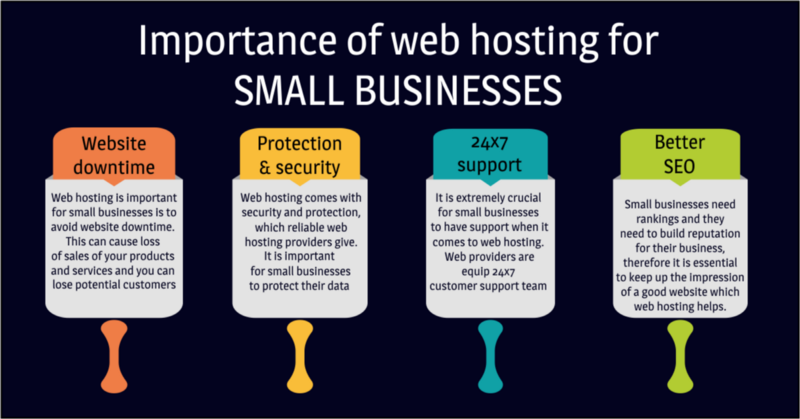 What actually makes web hosting so important for small businesses? The main reason why web hosting is important for small businesses is to avoid website downtime. This can cause loss of sales of your products and services and you can lose potential customers. If a website goes down due to web hosting maintenance or other problems, your users won’t be able to access your website and moreover it may affect the image of your company, resulting to bad reputation of your business. This is the most important factor to generate leads and build relationships with customers. If your website is always down, it forces your users to jump to another site and you lose a potential customer. Web hosting comes with security and protection, which reliable web hosting providers give. Viruses, malware and hackers can access your data or delete all your customer data, sales data, and all the information that your business needs to operate. A good web-hosting plan can help prevent hackers and malware to access your data and provide good security services. Hosting providers also protects the data you have in their servers. It provides server backups in case of any happenings. It is important for small businesses to protect their data and keep it secure so that they don’t have any problems in initial stages. It is extremely crucial for small businesses to have support when it comes to web hosting. One of the best reason for web hosting is that the web providers are equipped with 24x7 customer support team that will solve your problems related to website anytime. Even though you have made efforts to make sure, that your website runs smoothly, you will come across problems that will affect the performance. The support will ensure that your problems are resolved quickly and efficiently. The rankings of your website plays an important role in search engines and helps drive organic traffic to your site. Web hosting providers which are reputed will improve the SEO of your website and help you to perform better. A website with poor performance and slow loading time will again have negative impact on your company and will rank lower in the Search Engine results Page (SERP). It is a proven fact that people bounce if a website takes more than 3 seconds to load. This is also related to speed and search engines love speed. Depending on the speed of your website, the user judges your business. Small businesses need rankings and they need to build reputation for their business, therefore it is essential to keep up the impression of a good website. The importance of web hosting for small businesses have grown exponentially over the years and it will keep growing. Gone the days when only an operating website was enough for them. It is very crucial now to have a reliable web hosting provider to guide small businesses to the right path. What is a DNS Lookup?